Horses are such facinating creatures! Even if you never learned to ride or drive one, you could spend your whole life studying them and still have plenty to explore. Here are fifteen interesting facts about horses. Yes, horses do sleep standing up! They sleep laying down too, but only for short times. Learn all about the sleeping habits of horses. That's right! Horses can't burp, at least not the way humans do. They can't vomit or breathe through their mouths like humans do either. A horse's digestive system is a one-way street, unlike cattle and other ruminants who regurgitate food to re-chew it. Although they have a pretty efficient way of processing the tough fibrous foods that makes up their forage, this long, one-directional system can cause problems that result in colic. While you can't tell the exact age of a horse by its teeth, you can estimate its age. Horses need proper equine dental care for their teeth, but sometimes a horse lives longer than its teeth do, so extra care is needed when feeding senior horses. One of the most common questions about horses is 'how long does a horse live'. The answer may surprise you. Our knowledge or horse nutrition, horse care and veterinary medicine has increased. Because of this, just as human life expectancy has increased, so has equine longevity. Appreciated by beginner riders and professional horsemen alike, the American Quarter Horse is the world's most popular breed. Learn about the American Quarter Horse. The Arabian Horse is the foundation of many other light horse breed. They also possess some unique characteristics. Arabian horses have one fewer vertebrae, rib and tail bone than other horses. Learn about the Arabian Horse and it's unique history and characteristics. Humans are omnivores, lions are carnivores, and horses are herbivores. The way their teeth are formed, the position of their eyes and their digestive system are all typical characteristics of herbivores. Horses in the wild live in small herds, and domestic horses feel more comfortable if they have companions too. It can be quite stressful for a horse to live alone. To keep your horse happy, it will need a (preferably equine) friend. Dogs may have become domesticated around 14,000 years ago. Cats became our companions about 8500 years ago. Humankind's relationship with the horse began a little more recently, about 3500 BC although some evidence has come to light that horses may have been domesticated even earlier. The standard measurement for determining the height of a horse is called a hand. A pony is any equine under 14.2 hands. The only equines not measured in hands are Miniature Horses that are measured in inches or centimeters. Most of the white horses that you see were actually a much darker color at birth and gradually turn white. These 'white' horses may start out as bay, chestnut, or almost black. These horses aren't actually called white, but gray. It's important to know the resting pulse and respiration rate of your horse. While the resting respiration rate of a horse can be as low as four breaths per minute, that can quickly increase with work or distress. Learn your horse's resting pulse and respiration rate or TPRs. Every horse on the North American continent are decedents of European horses. Even the horses that we regard as 'wild' are actually feral horses, whose ancestors escaped from captivity. Horses disappeared from the Americas over 8000 years ago and there is ample fossil evidence that the horse's ancestors lived here previous to that. 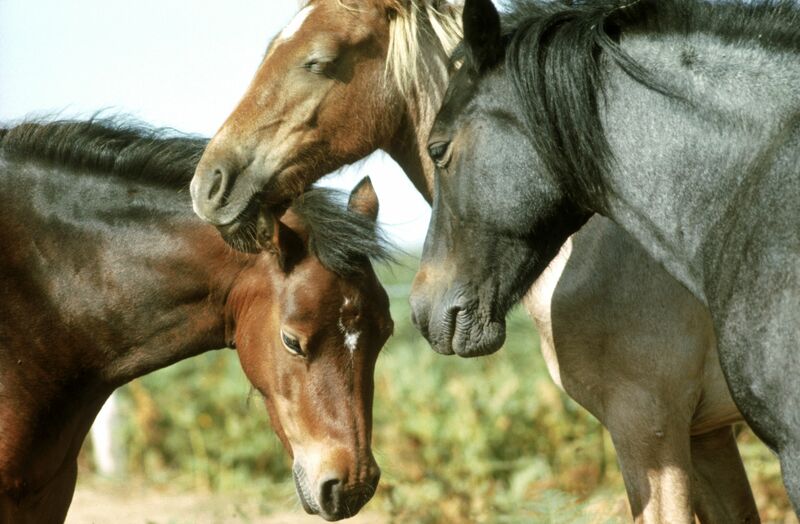 What is the difference between a filly, colt and foal? It all depends on gender and age. Generally, a foal is a baby horse. After it is weaned from its dam, it is called a weanling. But, horses remain fillies or colts until they are two years of age. The original horse was no larger than a Golden Retriever. Diminutive Hyracotherium may have looked more like a small goat or deer than a modern-day horse. Hyracotherium lived during the Eocene epoch about 50 million years ago.